This is one of the major customer experience problems that companies try to solve by improving online customer journeys. The main objective being, of course, to keep visitors on your journey, or in other, more techy words, to reduce or keep a stable bounce rate. There are hundreds of checklists out there with advice on how to decrease bounce rates, but we have failed to see one that merges the AI and website design elements. Pairing these can be the differentiating factor that makes your website memorable, one that visitors want to spend time on. These days the majority of automated actions on websites are said to be AI. The definition of the word is somewhat generalised so it can be widely applied to various concepts. At giosg, we use the term AI when we discuss predicting conversion probability (in other words, how likely a visitor is to convert). AI tracks your visitors, checks their historical data and uses this as the core for the actions that follow based on the predicted conversion probability. reminders of an existing trait - free delivery etc. This, of course, is closely linked to the personalisation of customer experience, one of the essential ways of keeping your visitors’ fleeting focus. Showcasing your brand in a way that matches your visitors’ actual interests directly affects their decision to stay on the designed journey. For instance, if the data indicates that the visitor is very likely to engage with an industry-specific bit of content or a live chat conversation, your website’s AI helps identify that and delivers accordingly. Customer pattern recognition works in a similar way, it uses the same idea for personalisation as a website recommendation tool, identifying the blog posts, news, videos, etc. that a visitor has shown interest in and making suitable recommendations on their feed. In our whitepaper we argued that customer journey mapping is vital in preventing customers from leaving your site by allowing an effortless cross-cutting movement between landing pages. Cross-linking is a big part of this but so is the overall design of your pages. The flow of your individual landing pages plays the most important part here. The visuals, the structure and most importantly, the navigation must guide the visitor in the right direction. Calls-to-action (CTAs) – we all know the importance of CTAs in keeping visitors on your site. There are so many nice-looking websites with terrible CTAs that look like third-party banner ads that may give your device a souvenir virus. Visually speaking, the real insight here is implementing CTAs as part of your site’s graphic portfolio. Again, a coherent design is key in leading visitors through the journey towards any given CTA. The “above the fold” concept originated from newspapers, they put the most interesting bits of news on the top half, above the newspaper fold to capture people’s attention. In this context, it means that the first impression is the one that counts and you have the first three seconds of a visit to make that impression, so relevant content must hit the visitor at the very point of arrival. They should be able to get an idea of what your landing page is about within that timeframe. Some studies indicate that visitors are becoming more forgiving and eager to scroll down sites, largely due to the increase in mobile browsing. Nevertheless, we bet you still skip a whole bunch of potentially worthwhile content when browsing on your phone, and this is where Seth Godin's Purple Cow idea comes in. It is the basic idea of being noticeable and memorable by being different, like a purple cow! To offer an oversimplified example, if your competitors’ websites all have white backgrounds, perhaps you could consider a black one. Being a purple cow is good, but it’s not enough on its own, the functionality must always be there. Don’t be scared of being a little crazy, just make sure that everything works as it should. Website design and AI - it’s a match! Now, have we Karate Kid Miyagi’d you? Hopefully by learning one thing you have simultaneously learned another- finding out how AI and great website design can help keep customers on your site has hopefully helped you realise that one can’t excel without the other. 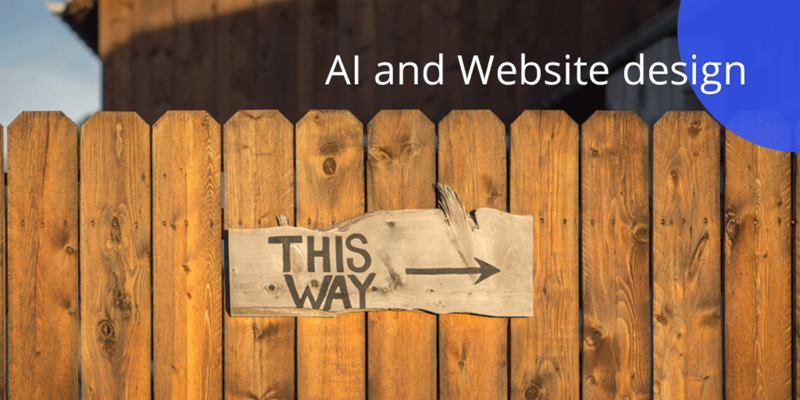 To describe the relationship between the two, you could argue that website design creates the blocks that AI then investigates and builds its actions on. These blocks can be anything from a line of code to simple website templates. If the visitor scrolls towards or engages with a certain element, AI wakes up, analyses the visitor and offers a touchpoint, for instance a CTA for a blog subscription or a pop-up. Without a good website design, AI has limited space to operate in. What is new here? Well, companies have certain digital business goals like increasing total visits or online store sales. Normally, companies come up with a design and adjust their goals accordingly. But it should be the other way around, find a goal for the AI to study and build your design on top of that. When the goal is the driving force behind your design, the customer journey becomes clearer, your customer experience improves and by doing so, you better satisfy your visitors’ needs, making them keep your company’s tab open a little while longer. 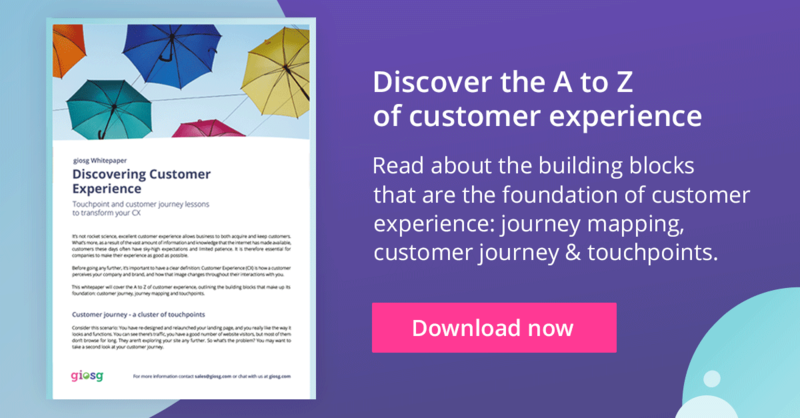 Interested in reading more about customer journeys? Check out our whitepaper below!